Interoperability is an important pre-condition for achieving higher stages of e-government and further ensures that a one stop portal will become a reality. Interoperability results from vertical and horizontal integration. The question arises: How can the level of interoperability and degree of integration be ascertained? This paper suggests a framework. It begins by identifying critical factors necessary for the successful adoption of interoperability technology along three dimensions of integration—process integration, communication integration, and data integration. Factors are formed from a literature review and discussions with webmasters and IT professionals working on portal development in various government departments of India. 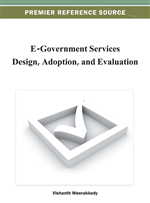 These factors are useful in further evaluation across the three dimensions and locate the position of a government portal in a technology adoption space. It is then possible to ascertain a portal’s current level of integration sophistication. One-stop government portal has emerged worldwide as a trend to offer electronically administrative service packages that meet the needs of citizens' life events and business transactions, with a promise to enhance service accessibility and alleviate service delivery delays and costs. For citizens, it is an important interface that can bring entire government at their doorstep to the extent that it might almost mirror the government itself. One-stop portal becomes a reality if back offices are interoperable (Choudrie & Weerrakody, 2007). Interoperability among Government organizations has been identified as a central issue and a critical prerequisite for the effective functioning of contemporary organizations systems (Klischewski, 2004; Peristeras et al., 2007; Tambouris et al., 2004; Tambouris & Tarabanis, 2005). To achieve an interoperable government, the integration of government information resources and processes, and thus the interoperation of independent information systems, are essential. Economic benefits of interoperability result in lower transaction costs typically utilizing standardized processes. Yet, most integration and interoperation efforts face serious challenges and limitations. Exchanges of information and services are fragmented and complex, plagued by technical and organizational problems (Gouscos et al., 2007). A distinction should be made between interoperability and integration. Integration is the forming of a larger unit of government entities, temporary or permanent, for the purpose of merging processes and/or sharing information. Interoperation in e-Government occurs whenever independent or heterogeneous information systems or their components controlled by different jurisdictions, administrations, or external partners work together (efficiently and effectively) in a predefined and agreed-upon fashion. E-Government interoperability is the technical capability for e-Government interoperation (Scholl & Klischewski, 2007). In this paper attempt is made to identify the organizational and technical factors of integration for an interoperable government portal in Indian context. A three dimensional adoption space model proposed by Chen et al. (2005) has been taken up to measure the level of integration. Three dimensions of integration are: Data, Process and Communication. All the dimensions and organizational factors are inter-related. Additionally, the factors of each dimension are in either positive (reinforcing) or negative (balancing) feedback loop. Key interrelations are demonstrated through causal loop diagrams as they enhance learning processes in the organisation by evaluating individual’s performance based on strategically linked measures (Banker et al., 2004). By identifying the factors along with their relationships, scholars and practitioners have a framework within which they can measure the current position of an organization and focus on improving the factors to achieve interoperability. The structure of the paper is as follows. In the following section, relevant literature on interoperability is laid out. Section 3, discusses the research methodology used in this research. Next, Section 4 introduces important organizational factors contributing to Integration maturity and influencing the adoption of Interoperability. Section 5 presents integration in three dimensions – data, process and communication and proceeds with their relevant determinants. Section 6 delves into synthesis of affiliation of organizational factors and the technical factors (three dimensions) including discussion. Finally, in section 7 the article offers some conclusions that include limitations of the paper along with future work.